Problem – Develop a more efficient design and assembly process for a fuel/air mixer. Solution –The original assembly consisted of five components – a CNC machined air mixer ring, a machined fuel mixer ring and three machined fuel tubes – which were welded together and tuned for the proper air-to-fuel ratio. The die cast tooling was designed to create the mixer as a single piece by pulling three slides for the 4-inch diameter, .3 pound fuel tubes and casting the air ports to size. The entire piece was precision cast in Al 384 as a ‘net sized” part in one of Rangers’ 400-ton die casting machines. 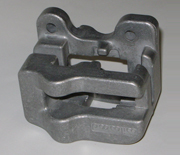 Benefits – Net-sized casting as a single component eliminated assembly and any final machining; only minor deburring was needed. Plus, the precision aluminum die casting did not require any final air-to-fuel tuning. There also were weight savings of 70% by casting the parts instead of machining them from aluminum billet. Problem – Develop a more efficient production process for a cast iron brake caliper used in snowmobiles and off-road quad vehicles. Solution –The original assembly consisted of two cast iron components that had to be bolted together. A new one piece aluminum die casting was designed to replace the two parts. The 3 x 4 inch, half-pound caliper was precision cast in Al 360 in our 400-ton machine. Benefits – The new aluminum die casting caliper eliminated assembly time, saving providing a 75% reduction in production time. Furthermore, the new component reduced the caliper weight by 60%, improving the performance of the snowmobiles and quads.